I looked up on my studio wall last night and had this overwhelming feeling that it was time to let Princess Leia go. She was painted in the weeks after Carrie Fisher passed away, and while many people expressed interest in giving her a home, she has remained on the feature wall in Birdsong Studio up until now. That will change at noon today. 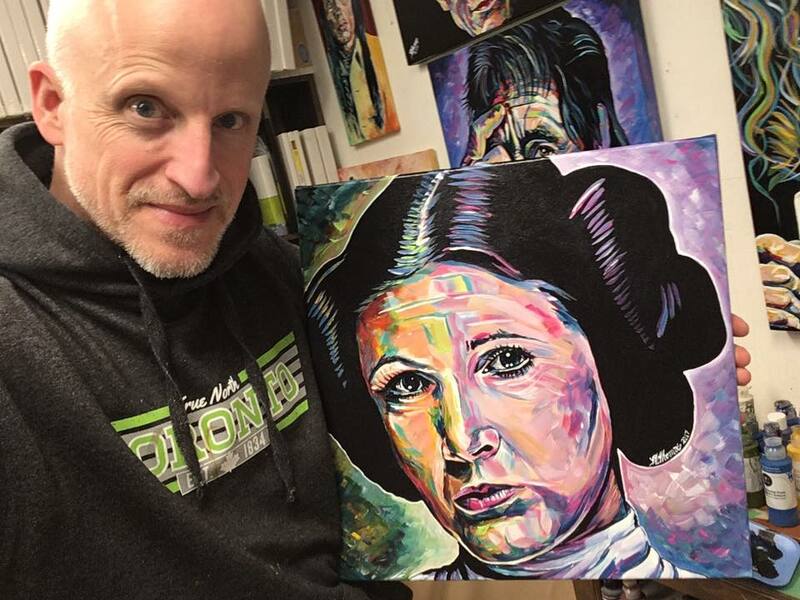 I am accepting bids on this 16" x 16" original portrait of this classic character from the Star Wars movies of my pubescent youth. Whoever has offered the highest bid will get the chance to take her home. The best place to put your offer is on my Russell Thomas Art Facebook Page. You'll find the post with me and Princess Leia near the top. Over the next weeks, I may do something similar with a few other original pieces that have been hanging around the studio for awhile. I need to make some space for new works. There are three workshops scheduled in the next few weeks and those always result in paintings that are new and available. Speaking of workshops, I am offering two intimate sessions right here in Birdsong Studio. I call them "intimate" because I am going to limit participation to only 6 people. It's a space thing. The studio can hold 8 or 9 people, but 6 feels better. 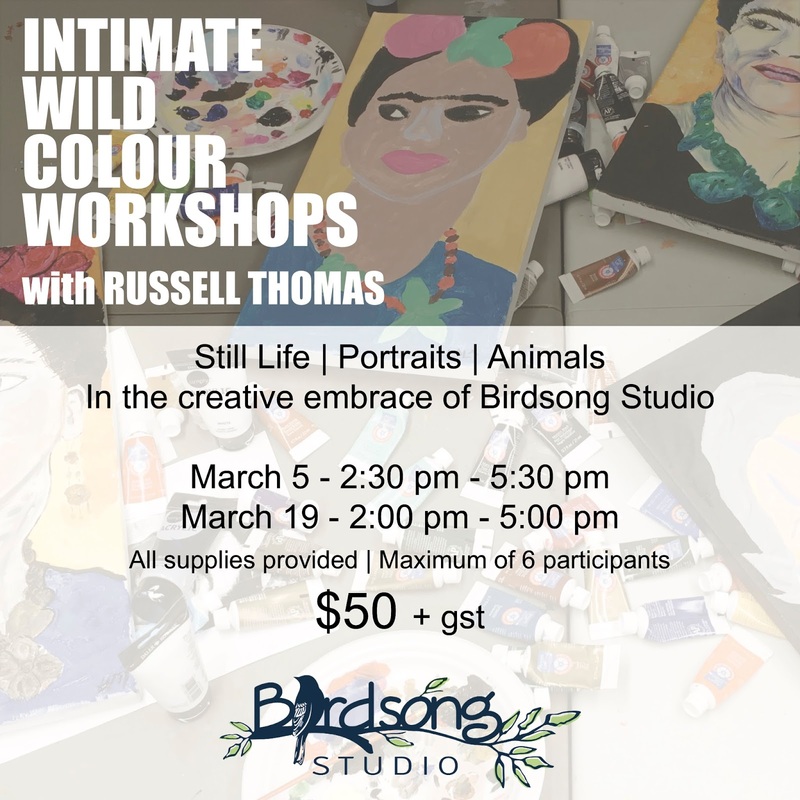 The cost is $50 + gst for a three hour wild colour painting adventure - all supplies included. 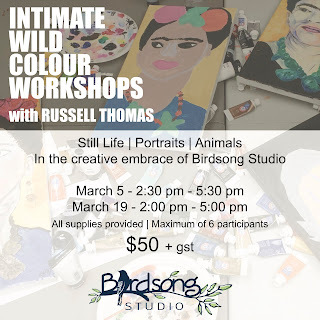 If you want to reserve a spot send me a message via my Russell Thomas Art Facebook Page, or, if you're not on Facebook, send me an email at russell.thomas@birdsongconnections.com or a text at 780-881-3752. Sessions are scheduled on Sunday, March 5th from 2:30 pm to 5:30 pm and March 19 from 2:00 pm to 5:00 pm. I will give you the address to the studio when you reserve your spot. It is centrally located in downtown Fort McMurray. Do you need to be an experienced artist? Nope, not at all. Some of the most beautiful paintings that I've seen come out of my workshops have been from individuals with absolutely no painting experience. Let me share two examples. My painting workshops are a little different from what you may have experienced in other settings. A good metaphor to explain what I do: I provide the roadmap and the means of travel, but you get to choose where you want to go. I also go on a journey with you. In other words, when you're drawing, I'm drawing; when you're painting, I'm painting. The results are always unique and often surprisingly good.